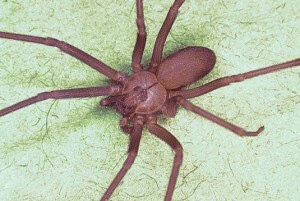 PMP sits down for an exclusive interview with a brown recluse spider (Loxosceles reclusa). Pest Management Professional (PMP): Thanks for agreeing to meet with me. Brown recluse (BR): No worries. I hope you didn’t mind meeting me here in my parlor. I’m not much for going out. BR: I suppose, yes. Better that than “fiddleback,” “brown fiddler” or “violin spider.” As you can imagine, high school was difficult for me. PMP: Why would anyone call you those nam— [BR silently indicates the markings on his cephalothorax.] Oh. That’s … unique. BR: Not really. Many spiders have similar markings, which is why they are often mistaken for me. There’s a much better way to identify me. PMP: That’s a lot of eyes looking back at me! BR: Ah, but not as many as most spiders. [BR points to his six eyes with one of his eight legs.] Most spiders have eight. But I have [counts aloud] one-two-three and one-two-three. Three sets of two: one median pair and two lateral pairs. PMP: I hope you don’t mind the change of subject, but do I detect a bit of a Southern twang in your voice? BR: You’re confusing twang with a Midwestern drawl. Me and my kin are spread out roughly from southeastern Nebraska through southern Iowa, Illinois and Indiana to southwestern Ohio. … Um, why do you keep squirming in your seat? PMP: I’m sorry. Just a little nervous, I guess. I’m unaccustomed to being this up close and personal with a spider. BR: Oh. You’re one of them — afraid I’m going to jump across the table, are ya? BR: You needn’t worry. I really have to be provoked before I bite. Generally, I just kind of retract from being touched. It’s my defense mechanism. But if I find my way into your work gloves and you stick your finger in and hit me — yeah, you might get a bite. But what would you expect? PMP: Well, let’s say, for the sake of argument, you do bite me. BR: I doubt I would, but if I did, there’s a good chance you wouldn’t even feel it initially. PMP: So your bites are pretty harmless, then? BR: Not exactly. My bites are occasionally quite serious. BR: My bites have a hemotoxic venom that’s potentially deadly. So most of my bites are minor, although a small number of them produce severe lesions. An even smaller number of bites result in severe skin and systemic symptoms. But rarely. BR: Here’s some perspective: It’s estimated that 80 percent of reported bites attributed to me have been misdiagnosed. But that doesn’t mean people won’t continue to freak out about me. Extermination of me is fairly common in the lower Midwestern U.S. But I’m good at choosing my homes. I have a great real estate agent. PMP: Yeah, it’s nice. A little off-kilter though, isn’t it? BR: Asymmetrical webs are how we roll. It might look like a tangle of disorderly threads, but I assure you, it’s good shelter. This woodpile against this garage was an ideal place to settle in. The rates are good. The view is nice. PMP: It’s cozy. Do you spend all of your time here? BR: Generally, but I don’t cook for myself and often go out to eat at night. And I know a nice little corner of this garage that’s just thick with crickets, cockroaches … and all kinds of soft-bodied insects. Delicious. PMP: Those are all the questions I have for now. Thanks for inviting me into your home for this interview. BR: No problem. Just do me a favor and try not to scare off any crickets on your way out. After two days of roaches, I’ve got a craving. PMP: I’ll do my best.